Qualified DUI lawyers know the laws and the science that can make the difference in the defense of a DUI case. On the legal side, there are hundreds of complex laws, administrative rules, rules of evidence and trial procedure that are involved in the defense of a DUI case. An understanding of the science requires a working knowledge of alcohol and drug interaction with the body. In this publication, we key in on aspects of the law and the science that comes into play with respect to DUI testing. Under Michigan’s Implied Consent Law, all persons with a Michigan driver’s license are considered to have given their consent to submit to testing upon the request of a law enforcement officer. Blood, breath or urine chemical tests are utilized to determine blood alcohol content (BAC) or the presence of drugs. Positive test results for illegal drugs, marijuana and prescribed medications are all fair game to support a charge of “operating under the influence of drugs” or “operating while impaired”. Commonly, the police utilize the breathalyzer to determine a person’s BAC. If a person is extremely inebriated or incapacitated, a blood draw at a medical facility is often utilized and also to allow for medical treatment and detoxification if deemed necessary. Michigan Drunk Driving Laws make the offenses of Zero tolerance (.02-.07), OWI (.08 or more) and Operating with a High BAC (.17 or more) presumptive crimes whereby intoxication is presumed based solely upon blood alcohol content, regardless of actual intoxication. Search Warrant for Blood Test: If you refuse the chemical test offered by the police, the police may obtain a search warrant for a blood test. If a search warrant for blood is approved, you will be transported to a facility, such as a hospital, for a blood draw by a qualified person. Your Right to a Second Test: If you take the test offered by the police, you are entitled to request a second test of your own choosing and expense. This right to a second test of your choice is forfeited if you have refused the test offered by the police. In some cases, a second test may be used as evidence to refute the first test obtained by law enforcement officers. Sanctions for Refusal: If you refuse a test, six (6) points will be added to your driver record license will be suspended for one year. A suspension of a license, or non-resident operating privilege, is automatic for any refusal to submit to the test. This is a separate consequence from any subsequent convictions resulting from the traffic stop or drinking and driving charge. If you are arrested a second time in seven (7) years and again unreasonably refuse the test, six (6) points will be added to your driver record and your license will be suspended for two years. If you refuse to take the test under the Michigan Implied Consent Law, or if the test shows your BAC is 0.08 or more (Operating While Intoxicated) your Michigan driver’s license will be destroyed by the officer and a 625g paper permit to drive will be issued until further action by the State of Michigan as to your license. Appeal Rights: The Implied Consent suspension may be appealed to the Driver Assessment and Appeal Division (DAAD). The request for hearing must be mailed within 14 days of the date of arrest or your operator’s or chauffeur’s license and vehicle group designation or operating privilege will be automatically suspended without a hearing. You are entitled to have an attorney present for this hearing. However, if you lose at this hearing, you have a right to appeal a first time implied consent suspension to the circuit court where the offense occurred and request a restricted license based upon hardship and need. You may also appeal based upon the merits of the decision of the DAAD hearing officer. 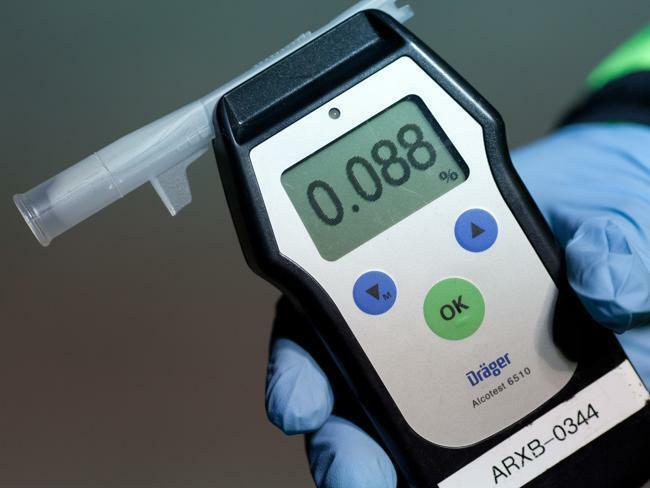 Alcohol testing (in connection with DUI cases) is accomplished by testing the blood, breath or urine of an individual. Analysis of blood is a direct method of testing for alcohol, while breath and urine tests are indirect methods. 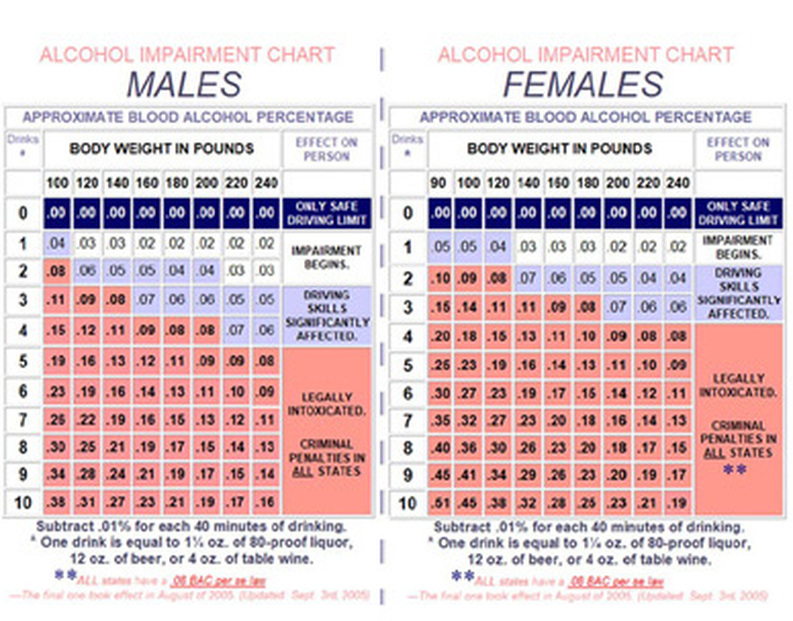 Alcohol graphs take three (3) major factors into consideration for purposes of estimating blood alcohol content (BAC). Those factors are number of drinks (based upon the above measurements) the body weight and the gender of the individual. Gender: In general, women have less body water than men of similar body weight, so the result is higher concentrations of alcohol in the blood after drinking. In addition, women have a higher concentration of body fat than men. Body fat does not absorb alcohol, which results in a higher concentration of alcohol in the bloodstream as well. Absorption: The process of alcohol being absorbed into the blood from the digestive system can occur over a period of 30 to 60 minutes but can take up to 2 hours. The recent consumption of food prior to drinking alcoholic beverages can slow down the rate of absorption. In addition, the absorption rate is faster when higher alcohol content beverages are consumed. Elimination: Like absorption, time is the major factor which has an influence on the elimination of alcohol from the blood. The average elimination rate for most drinkers is .010 to .015 per hour. Consumption of water does not have an impact on the elimination rate of alcohol. Ninety (90%) of alcohol is broken down or eliminated by the liver. The remainder is eliminated by breath, sweat and urine. CLICK HERE: For additional information on the topic of alcohol absorption and elimination. ABDO LAW, established in 1980, is a top rated criminal & drunk driving defense firm and has specialized in criminal law and drunk driving longer than most other firms. Our ratings include Martindale Hubbell’s AV rating (the highest possible rating for legal ability and integrity), ‘Top Criminal Lawyer’ by dbusiness and ‘Superb Attorney’ rating by AVVO.